Other features: Headphone output, auxiliary input. Simple, classic, no fuss amp. Looks may not appeal to everyone. arshall is famous for its amps. Especially for rock, blues and metal. Not that other genres don’t work well with the British brand, but it’s strength its in that area. 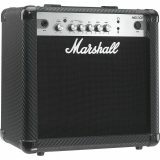 When I think about Marshall, I think about a 100 watt head and a 4×12 cab. The “Marshall Stack”. But Marshall have a huge range of amps. Tube amps, solid state amps, heads, cabs and combos. And of course, they don’t just cater for stadium guitar gods, they look after those needing a small practice amp. Enter the Marshall MG15CF 15 watt amp. The MG15CF is a straight forward amp, in a good way. You won’t find hair brained effects or bizarre specs…it’s a straight laced, classic tone machine. Oh, and did I mention it has 2 channels?! For those looking for a classic practice amp, this ticks every box. 2 channels allows you to set a clean tone volume, then have a totally different gain tone that can be activated with the overdrive select button. 3 band EQ is more than many amps in this range. Finally, headphones and aux input mean practising in a quiet way is a breeze. For the price point that this amp is at, 15 watts is right in the middle of the options available. You can get 20 watts around the same price (check out the Fender Champion 20), or spend a bit less for 10 watts (like the Vox Pathfinder 10 watt). As far as tone goes, I’m a fan of Marshall clean tones, and the MG15CF has that familiar feel to it. The EQ has a good effect on the tone, but you’ll need to experiment to find your personal preference. The party gets started when you hit the overdrive switch. With the gain down low, you can get a light crunch. A little higher (around 3) gives a smooth bluesy tone, which to be honest, I had fun with for about half an hour! Dialing higher brings the saturation up and now you’re talking rock and metal. Ease off the mids and go crazy. Black mesh front and the white Marshall brand are the key winners here. The thing that drives the most conversation with the CF range (which stands for Carbon Fibre) is the finish on the casing and the silver detailing. It’s a far more modern look, but I find it a bit cold. I guess I’m a sucker for that classic look. Check out our review of the Marshall DSL5C for an idea of the classic look. Simple, well built and well appointed. The Marshall MG15CF is a solid practice amp, delivering a classic Marshall tone, with the convenience of headphone output and an aux input (for MP3 play-along). It’s well priced and is a great little package.